Calcium and Magnesium have a natural affinity and when ingested together in proper proportion, they are utilized more efficiently by the body. Calcium is essential to the health of bones, teeth and muscles, and plays an essential role in blood clotting and nerve health. 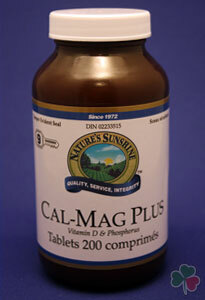 Magnesium activates more than 300 enzymes in the body and, with calcium, affects nerve and muscle functions. Vitamin D is also an important co-factor in the utilization of calcium and helps increase intestinal absorption of calcium and phosphorus. Suggestion Directions: Use 1 tablet with a full glass of water three times a day with food; once at breakfast, once at lunch and once at dinner to achieve maximum effectiveness. You may increase to 2 tablets at a time if recommended by a holistic health professional. For therapeutic use.